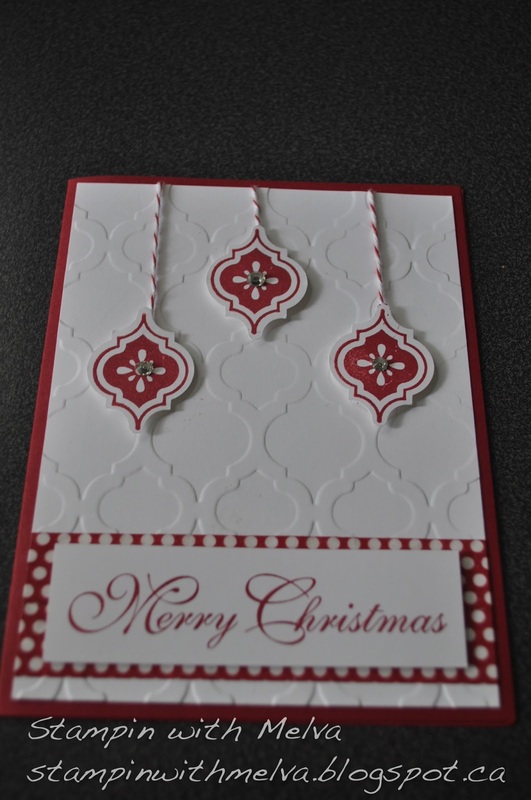 I participate in a monthly swap with some fellow demonstrators and our first month's theme was Christmas. I know it seems early, but it really isn't too early to think about Christmas. I got some fabulous cards in the swap - it makes going to the mailbox so fun each month as the cards are mailed separately. You never know what wonderful surprise is going to be in the mailbox from day to day. I used the Mosaic Madness Stamp Set (Item 130249) that coordinates with the Mosaic Punch (Item 131267). This makes perfect little ornaments. 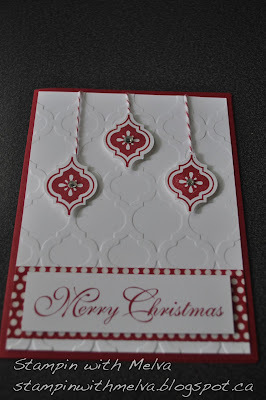 I embossed Whisper White Cardstock using the Modern Mosaic Embossing Folder (Item 129984). Add a little Bakers Twine to make the ornaments look like they are hanging. This was my first card using Washi Tape. I used one of the designs from Seasons of Style (Item 132155) and love how this turned out as a background for the sentiment. We'll be making this card in my Christmas Stack-a-Stack on November 2nd. Come to my event and you'll go home with 15 cards (3 cards of 5 designs) with envelopes for $25 and will have a good start on your Christmas Cards. If you're interested in registering for this class, email me. Stay tuned for some other sneak peaks of my upcoming classes, including my Birthday Card Class on September 14th.